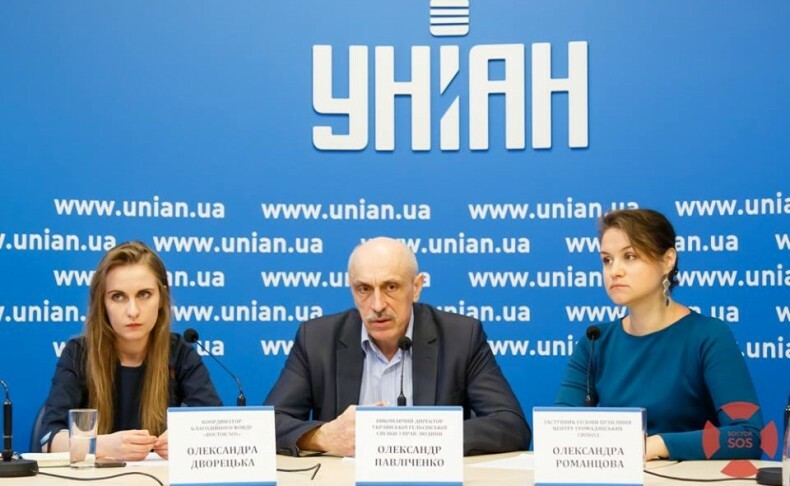 On April 11, newly formed Coalition for the Protection of Civil Society in Ukraine was presented during a press conference in Kyiv by members of leading human rights NGOs. The Verkhovna Rada of Ukraine, despite the promises of Parliament members from various factions, on April 3, 2018 did not vote to put on the agenda the draft laws prepared by individual Parliament members and the Presidential Administration, which would have abolished mandatory e-declarations of assets for activists. Meanwhile, with the time for submitting e-declarations expired just a few days ago, defamatory statements regarding certain representatives of civil society, who have dutifully provided their declarations, are already being published. Since the beginning of 2018, human rights activists have noticed rising pressure on activists in regions. Peaceful demonstrations are being attacked and physical violence is used against individual members of civil society, with such incidents usually left without proper investigation and the perpetrators left unpunished. Harassment by state authorities also takes the forms of trumped-up charges and financial audits of organizations. This situation requires close attention of our society, thorough documentation of all such violations and proper investigation of all incidents. Combining their efforts and ensuring proper development of civil society in Ukraine, civil society organizations will work together to overcome the negative effects of the harassment and oppression they face. “Active involvement of individuals, groups, organizations and institutions in the protection of human rights, fight against corruption and defense of public interests is essential, since civil society, among other things, helps governments to properly fulfill their commitments on protecting human rights and fundamental freedoms, fighting corruption and defending the principles of democracy and the rule of law.” – quoted from the Memorandum signed by 27 NGOs and open for signature to organizations, activists and members of the press. “Attempts to control civil society are a disturbing sign that requires NGOs to act,” says Oleksandr Pavlichenko, Executive Director of the Ukrainian Helsinki Human Rights Union. “Legislative initiatives aimed at restricting freedom of association are unacceptable for Ukraine, considering its international commitments. The reaction of the international community to the introduction of e-declarations for activists shows how important supporting civil society is for Ukraine’s partners,” comments Project Coordinator of the Center for Civil Liberties Oleksandra Romantsova. “The Coalition will detect and respond to any instances of harassment targeting civil society in Ukraine. Strong and influential civil society was one of Euromaidan’s demands and remains the main force behind reforms in Ukraine and their implementation at the local level,” says Oleksandra Dvoretska, Executive Director of Vostok-SOS charity foundation. The Memorandum can be found here: https://goo.gl/23VUzy, to get involved and join the Coalition, please fill out this form.